(31) St John’s Wood, (near the world famous Abbey Road Studios) – A trip out to North West London for a lengthy interview at the exclusive, Ivy restaurant, with (the delightful) presenters, Magdalena and Pawel of the top, East Poland, national radio station, Radio Lublin. The Pepper album and movie were naturally discussed. (30) Overcast Berkshire – Further work on the latest Rockin’ The Box piece for Record Collector magazine, a fiftieth anniversary feature on Brian Epstein’s very last, now largely forgotten, television interview, for News At Ten in July 1967. - Marilyn was still placed at #1 in the “Most Gifted in Monroe, Marilyn” section on Amazon Canada. (28) Goodreads – Many thanks to “Peter Wilson” for his five-star review of Marilyn on the world renowned, book reading site, Goodreads. (27) Wembley, London – Yay!!!!!!!! Keith’s beloved Arsenal won the FA Cup AGAIN, (easily) beating Chelsea 2-1. “What a superb, stunning performance from Wenger’s boys!” And a truly magical day!! - Many thanks to “Stefano C” for his five-star review of Marilyn on Amazon Italy. (26) West End London, Picturehouse Central – The big-day finally arrived. The UK/ London Premiere of the new Pepper movie , It Was Fifty Years Ago Today took place in Central London. A Q&A with the film's director, Alan G, preceded it… "A splendid time was certainly had by all." - BBC film reviewer, Mark Kermode reviewed It Was Fifty Years Ago Today, The Beatles: Sgt Pepper & Beyond on BBC Radio 5 Live. - BBC Four aired (at 10pm) Sharon Osbourne Presents Rock N Roll’s Dodgiest Deals, which featured Keith’s latest TV credit. (22) Canada – For the third straight day, Marilyn was at No.1 again in the “Most Wished For in Monroe, Marilyn” section on Amazon in that country. (20) Canada – Marilyn went to the No.1 AGAIN in the “Most Wished for in Monroe, Marilyn” section on Amazon Canada. (16-17-18) Sunny Berks – Three mad days of CCR researching and typing. - Big news time! The Pledge CCR (in London 1970 and 1971) book / photographic campaign officially went live on the eighteenth. (15) A Rather Sunny Berkshire – What a day… what a day… CCR, Queen, and Marilyn… conversations with Simon L, Mike R, Paul S and my TV agent, Yasmin. What a day! Non-stop! - Both Apple News and Empire Magazine carried most favourable reviews of the It Was Fifty Years Ago Today movie on their websites. - Goodreads – Many thanks to reader “Jessica Avery” for her five-star review of Marilyn on the site. - The new Pepper film, It Was Fifty Years Ago Today was STILL at #1 (DVD at #2) in the “Hot New Releases in Music Video & Concert” listing on Amazon.co.uk. - Keith’s Marilyn (softback edition) was at #3 in the “Most Wished For In Monroe, Marilyn” listing on Amazon Canada. (10) South London – A trip out to Bermondsey to see Keith’s old, long-time mate, Terry R. Several bottles of… Diet Coke were consumed in a most eventful 3-hour session. - Further major news. Pepper movie director, Alan G. will be a guest on BBC Breakfast Time next Thursday (May 18) to discuss and promote the new Pepper film. (8/9) Sunny Berkshire – Even more work on the forthcoming CCR book project. -It is announced that the new Pepper film will be screened on August 27 at the big, annual Beatles Convention in Liverpool. A Q&A with Alan G. is scheduled to follow it. (3/4/5) Overcast Berkshire – Further text work on the new CCR project. - Marilyn sat very nicely in the #3 position in the “Most Wished For in Monroe, Marilyn” section on Amazon Canada. - Keith’s Sgt Pepper / 50th Anniversary interview for an East Poland radio station, on May 31 was confirmed today, but the logistics of it had yet to be confirmed. - Big news time! The USA/South America distribution for the new Pepper film was now complete. It will be handled by Bob Frank Entertainment. March 2017... Unveiling of The Beatles film, Lawford, BBC Four, CCR, the Cavern, and Marilyn! (31) West End – Another monstrously busy business day, with activities firstly taking in Slough. Then (after boarding a fast train), operations shifted to London with visits to Langham Place (for work on a new BBC Four show), High Street Kensington, Charing Cross Road (aka “The Office” where Keith met director, Alan G and Andre formerly of The Bootleg Beatles and now co-manager of them) and then Langham Place again (when he saw colleague and long-time friend, Andy). (30) Sunny Berkshire – Busy on CCR. Keith also received an offer today to work on a new, official Sandie Shaw documentary. (29) Leafy (but overcast) Berkshire – Work time today was split between the forthcoming CCR book and a new project involving Sara Cash, the wife of legendary DJ, Dave. With an ace design for it, just sent in from top designer, Paul S, the venture excitedly (and suddenly) moved-up another notch. (28) Sunny Berkshire – Formative work on a new photo book project involving the legendary American rock band, Creedence Clearwater Revival. (27) Canada – With stocks of the softback now sold out on the site, and deliveries of the book not expected for 1-2 months, the paperback version of Marilyn unsurprisingly returned to the #1 spot again (!!!!!!!!!!! ), this time in the “Most Wished for Monroe, Marilyn” section on Amazon Canada. - Speaking of the legendary actress, plans to turn Keith’s book into a major television production moved that little bit closer when optimistic discussions about it, between him and his Film/TV/Media agent, Yasmin took place today. - Has the Cavern book text finally been approved and signed off, we wonder??!! - Plans for another hook-up in London, this coming Friday, with Alan G. was hatched this afternoon. (23-24) Leafy Berkshire – Further work (can you believe that) on the Cavern book text, in addition to conversations with Sara Cash (about another new, ongoing project). Keith also prepared an updated version of his biography for use in promotions of the new Beatles film. - Also on the 24th, the softback version of Marilyn was spotted at #2 in the “Most Wished For In Monroe, Marilyn” section on Amazon Canada. (22) Leafy Berkshire – More forthcoming projects discussed, including one (a film biog) on a very well-known nightclub personality… with a background of over 50 years. (21) Leafy Berkshire – Another frantic day of emails/ phone calls, catch-ups and sorting things, particularly with regards to the special Record Collector / Circus piece and the on-going book idea with Sara Cash, widow of the legendary DJ, Dave. - A much-needed update on this site was carried out today. - Another project with the Rock Gods, Queen in the offering, we wonder? (20) Canada – In the Marilyn Amazon Bestsellers Rank, with stocks completely depleted, the softback version found its way up to #3 in the “Most Wished For” category. While in some of the other charts that day, the paperback edition was to be found at #18 in the “Biographies & Memoirs > People, A-Z > ( M ) > Monroe, Marilyn” and at #231 in the “Humour & Entertainment > Movies > Biographies” sections of the site. - UK - Excitement continues when Record Collector magazine announces they will be featuring the remastered Circus ’68 images in a spread of a future Rolling Stones special edition version of the mag. -The planned premiere today of the official trailer for It Was 50 Years Ago Today failed to materialise due to various unforeseen problems. - West End, London (afternoon) – For the first time in possibly five-years, Keith met with his old, long-time pal of almost 30 years, Andy Neill. A pizza restaurant was chosen and a rather pleasant, four-hour catch-up was had by both of them. (15) London, England – Keith was invited to the “Beatles Unseen” launch party, at the Proud Gallery in Camden this evening but, due to logistical problems, was unable to attend. Keith’s role in the picture was also noticed, with Porter saying, “there is plenty of footage of the Fabs, much I hadn’t seen before, as collected by Keith Badman, Beatles archivist extraordinaire.” Thank you, Richard! (10) Canada – Paperback Marilyn suddenly raced up to the #11 position in the “Best Sellers in Monroe, Marilyn” section on Amazon Canada. And with that, the site / company was completely out of any actual psychical copies of Keith’s book on the actress. - Would you believe, even more editing / revision of the text to be featured in the forthcoming official Cavern club book. (6– 9) South Coast – Keith took his twice-yearly trip down to Lawford-Land by the sea. (2) Leafy Berkshire – Another frantic day when video grabs for another Rockin’ piece was sent to Record Collector magazine. 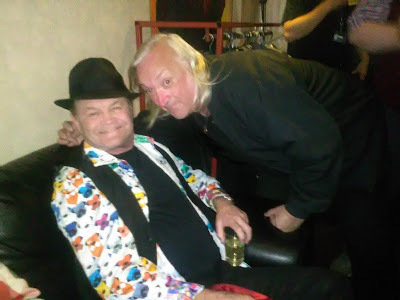 (1) Leafy Berkshire – Keith met for lunch with his old friend, the comedy producer and Queen production legend, Simon Lupton. February 2017...Marilyn, The Beatles film is (almost) finished but the Cavern book is not! (28) Leafy Berkshire – Keith spent the afternoon helping American author, John Brady with questions relating to Marilyn for his forthcoming book on the love affair of screen legends, Frank Sinatra and Ava Gardner. (27) Leafy Berkshire (evening) – Another old-mate catch-up when Keith crossed paths with Gary, a friend of his for over 40 years! (21) UK - Amazon.co.uk announced today the release of a new softback version of Marilyn. (16) Soho, London – Following a special screening of the completed movie, the producer of it, Reynold liked what he saw and happily “signed it off,” which meant the release of it edged that much nearer. “Great news!” the team on the project screamed. (25 – End of month) Leafy Berkshire – Unperturbed, Keith continued with his work researching / clearing archive footage and stills for the new Beatles film. “The WeTransfer site was certainly kept busy during these days,” he joked. (25) London, England – An official, legal reply was sent to the legal representatives of a certain “well-known” British pop group. The letter made it abundantly clear, “You cannot stop us. We are doing nothing wrong and we are not infringing any of your copyrights.” We waited for a response… And until we receive one, the production on the movie would rumble on. - Amazon Canada – With just one copy left in stock, Marilyn (paperback version) was spotted at #2 in the “Most Wished For in Monroe, Marilyn” section on the site. - Legal matters on the film were discussed with producer, Alexa M this afternoon. (23) Beatles movie poster – A “legal” letter was received by the producers of the It Was 50 Years Ago Today movie. It had been sent by lawyers acting on behalf of a certain, well-known “pop group.” They made it perfectly clear their “clients” were not happy with the film they were producing and demanded to know more about it. As a result, the movie poster and all literature about it had to remove from several sites, including this one until the matter had been resolved. (18) London, England – Early promotions for the new Beatles documentary continued when the London-based film promoting company, Primal Screen distributed the newly created, excellent poster for the movie…. It was noticed by representatives of a certain, well-known “pop group” who immediately decided to take action against it. (16 onwards thru month) Leafy Berkshire – Keith carried out continuous archive research and clearance work on the Beatles movie documentary. (9 – 12) Leafy Berkshire – Four days of non-stop archive research on the new Beatles doc. (5 – 6) Leafy Berkshire – Time for another Rockin’ episode in Record Collector magazine. This month, Georgie Fame & The Blue Flames’ January 1975 appearance on the long forgotten, Tyne-Tees music series, The Geordie Scene. (2) Leafy Berkshire – Welcome back. Here’s to a great 2017… It was a day of email catch-ups, Liverpool train and hotel bookings and further work on the new Beatles movie. A return to the world famous Ealing Film Studios in London is on the cards for tomorrow (Tuesday). - Canada. Still hanging in there. The paperback edition of Marilyn was seen in the #23 position in the “Best Sellers in Monroe, Marilyn” listing on Amazon Canada. This meant Keith’s book on the late, great actress (in any format) has been in the Top 40 charts on the lady consistently since its release in Canada in August 2012.